I admit, I skipped the #quinoa craze a few years ago. I thought it would be very similar to couscous, which I don’t have the taste for. Over the years I have of course, come to love quinoa, and its adaptability. So what is quinoa (keen-wah)? Well, officially, it’s a seed. However, it can be prepared just like whole grains such as rice or barley. It tastes great on its own, but is delicious when tossed in salads, stir-fries, or even to coat protein. It provides all 9 essential amino-acids, making it a complete protein. It’s also gluten-free and cholesterol free. Cooking quinoa is super simple. Just remember that it’s a two-to-one ratio, just like rice. For every cup of quinoa, you will need 2 cups of water or broth. This will yield 3 cups of cooked quinoa. Rinse raw quinoa in cold water, and then bring the 1 cup of quinoa and 2 cups of water to a full, rolling boil. Once it reaches a boil, turn the heat down to a gentle simmer. Cover and let it cook for 15-20 minutes, depending on the package instructions. Once your timer is up, fluff with a fork. Simple! - Wash and dry all your veggies. - Gently remove the kale leaves from their hard center stalks. I like to wash them and toss them in a salad spinner to remove all the water. - Slice the onion into thin ribbons. - In a large pot, boil enough water to accommodate all 4 peppers. - Slice all the cherry tomatoes in half lengthwise, put aside. - On a chopping board designated for meat, chop the chicken breasts into small pieces. I chose to chop them into very tiny pieces, smaller than a normal bite-sized piece so that they could easily stuff the peppers. - Toss the diced chicken with a dusting of cornstarch. This is done easiest by placing a small amount of chicken in a bowl, tossing it with cornstarch, and then adding more chicken and repeating. This way all the chicken gets a nice dusting of cornstarch. This helps with keeping this usually dry meat tender, and also gives it a bit of a coating and thickening agent. - Once the water is boiling, season the water generously with salt and dump the peppers into the pot. Parboil them for about 3-4 minutes, depending on the size of the pepper. Usually you throw stuffed peppers into the oven for a bit, but these don’t need to be since the stuffing will be cooked on the stove, and there isn’t any cheese! So make sure the peppers are tender and cooked thru before removing them. Season the inside of the peppers as you like. - First, we are going to cook the chicken. In a nonstick skillet, heat a drizzle of EVOO on medium-high heat. Cook half of the onions until translucent, and then dump in the diced chicken in one even layer. Season with salt, pepper, and garlic powder. You can definitely use any seasoning you wish, say cayenne pepper, cumin..TJ’s 21 Seasoning Salute. - Allow the chicken to brown in this even layer, and then flip and allow the chicken to cook through. Taste it to see if you need to season it more. - Remove and put the cooked chicken in a bowl. - Heat the skillet on medium-high again, then browning the other half of the onions. Start piling in the raw kale, gently lifting the bottom layers back onto the top of the pile so that it all cooks evenly. Drizzle the raw kale with olive oil, season with salt and pepper. Lemon is also great. 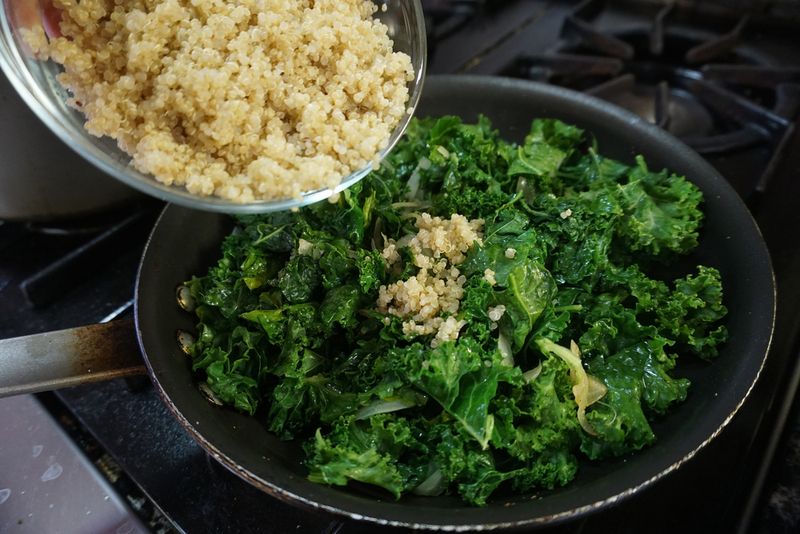 It’s easier to season the kale after a little EVOO is coating it. - You can see that the huge mound of kale cooks down significantly! Add the cooked quinoa, chicken, and golden raisins and toss together. If you’re adding bacon, add in bite-sized chunks of bacon. When you are ready to serve, toss in the halved cherry tomatoes and stir to incorporate them so that they get warmed through. You and your loved ones will love these…they are surprisingly hearty! It’s important to eat a variety of colors. Different nutrients impart different colors to the foods they’re in. Eating a variety of colorful food provides vitamins, minerals, and antioxidants to nourish your body that can’t be replicated in a supplement. Different colored foods play different roles in the body. Aim for at least three colors at every meal and two servings of fruit and three servings of vegetables over the course of the day.